According to the 17th century chronicler of artists' lives, Arnold Houbraken, Karel du Jardin was the pupil of Nicolaes Berchem (1620-1683). Like his teacher, he became one of the leading practitioners of Dutch Italianate painting in the Netherlands. While we are certain that he travelled in his late career in 1675 to Italy, it has also been speculated that he made an earlier trip in c. 1650-1652. We know that he visited Paris during this period and Houbraken informs us that he married Suzanne van Royen in Lyon. Important influences on his approach to Italianate painting were the paintings of Pieter van Laer, known as Bamboccio, especially for the figures in his early landscapes, the sunny views of the Italian campagna by Jan Asselijn, as well as Berchem's bucolic scenes. The present work is typical of his work in its sun-filled view of the campagna with figures travelling a road with a walled castle and mountains beyond. A favourite motif was the inundated roadway with figures fording the shallow stream and their animals watering. A woman in red and russet coloured attire raises her skirt to wade across, while a pack animal heavily laden with panniers drinks and a man stands astride a white horse behind. In the lighted roadway retreating behind the repoussoir at the left, two kneeling peasants, one on the ground and the other balancing precariously on his burro, pray at a roadside shrine. Both Smith (1834) and Hofstede de Groot (1926) commended the picture as "excellent", with the former adding the observation, "The effect of a fine evening gives lustre to the scene." Du Jardin expert control of tone and lovely pellucid atmosphere make his late afternoon scenes particularly inviting. Ernst Brochhagen compared the mountainous vista in the background of this scene to the alpine views of Jan Hackert (1628-after 1685), specifically to his view of the Lake of Zurich (Amsterdam, Rijksmuseum). He also claimed that a date "165[?]" appeared on the picture, although no earlier author had observed a date. While no date appeared on the picture when it was sold in 1994, the authors of the sale catalogue correctly surmised on the basis of style that the picture could not date as late as the paintings made at the end of his career in Rome in 1675, proposing instead a date in the "1660s." The painting also surely post-dates early works like Du Jardin's Travellers on a Road dated 1652 (Brussels, Musées Royaux des Beaux-Arts). 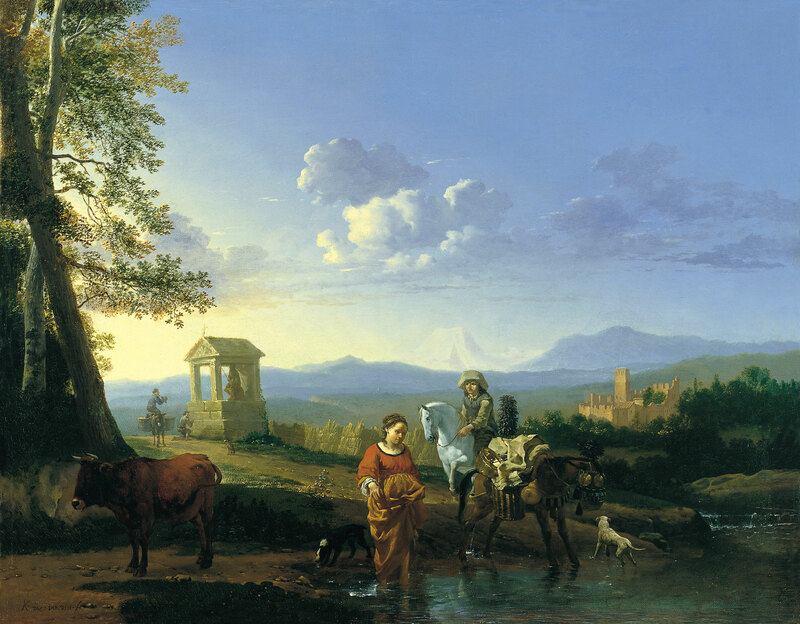 It most closely resembles the painting signed and dated 1660 of a landscape with a woman, child and livestock fording a stream (Antwerp, Koninklijk Museum voor Schone Kunsten). Not only are the theme and design (the coulisse at the left and the open landscape with buildings beyond) similar, but also the light is treated in a similar fashion and the solid little figures handled with comparable technique. Even similar poses are used. If the partially legible date that Brochhagen reported seeing was the remnant of an actual one we might logically conclude that the stylistic resemblance to the Antwerp painting pointed to origins in the late 1650s.